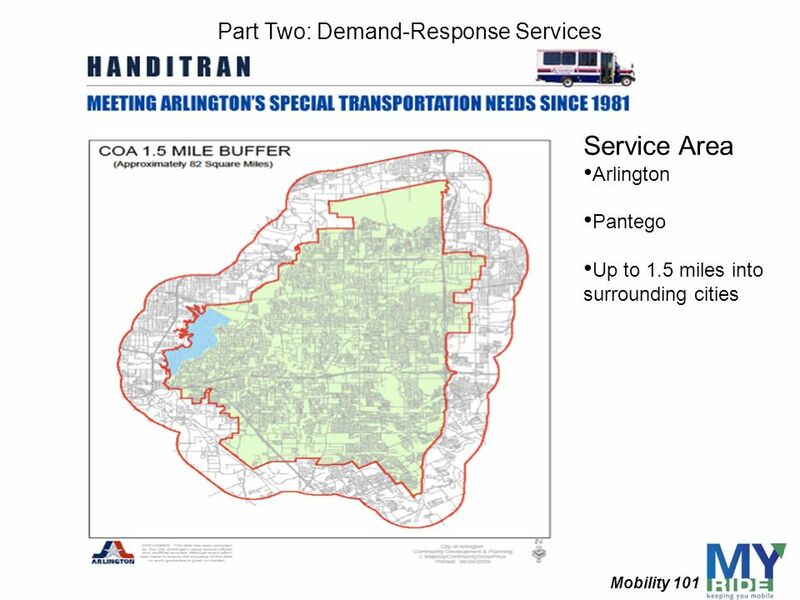 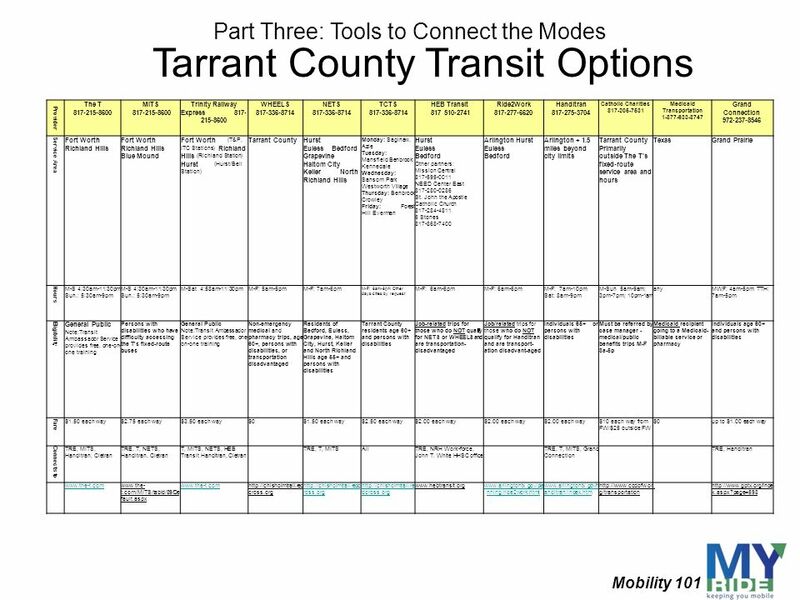 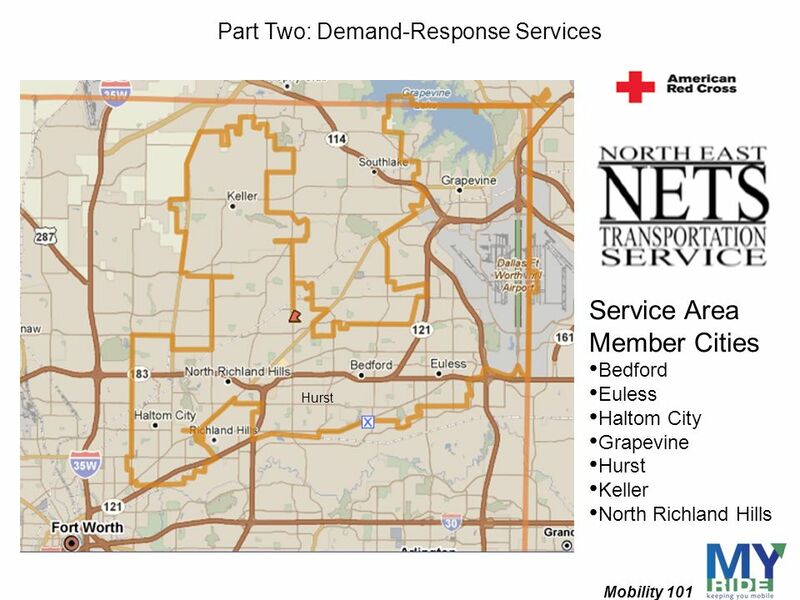 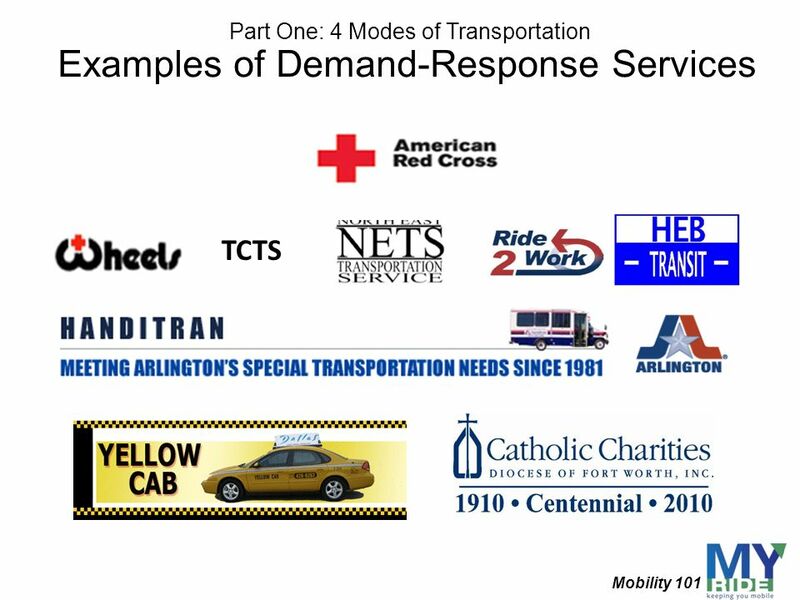 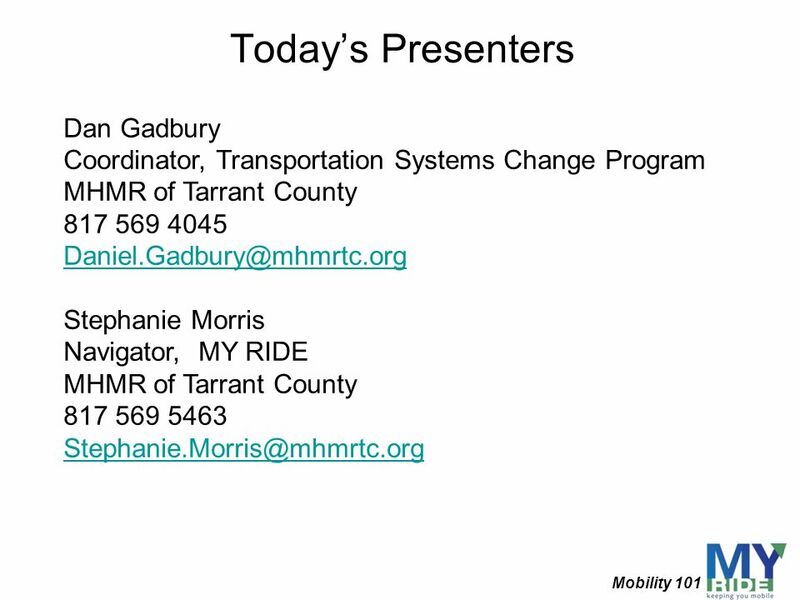 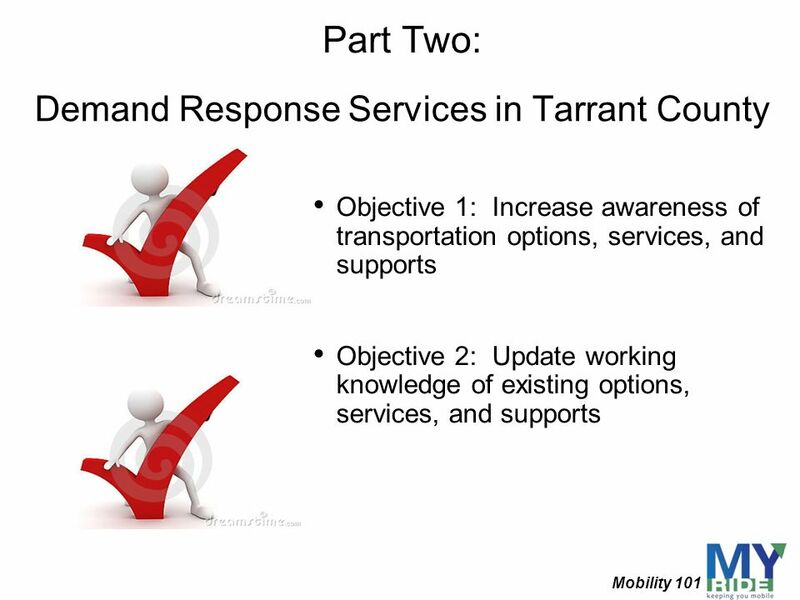 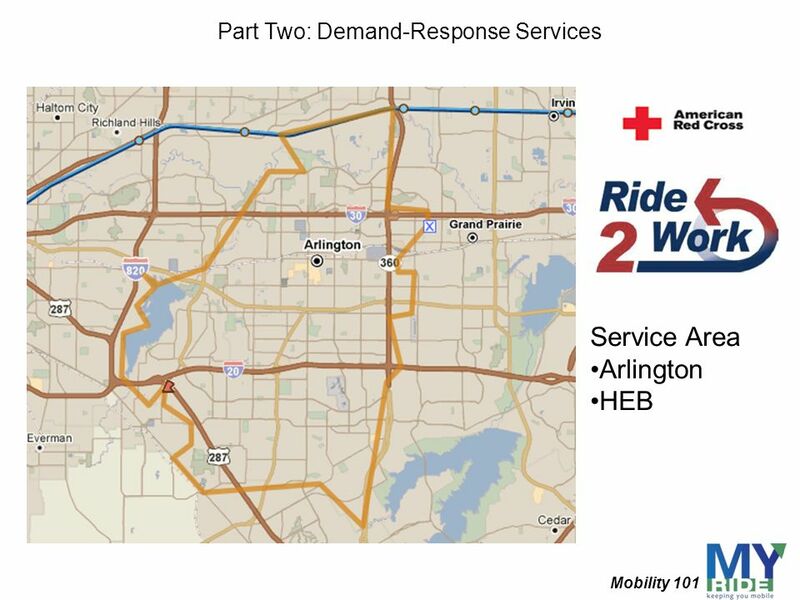 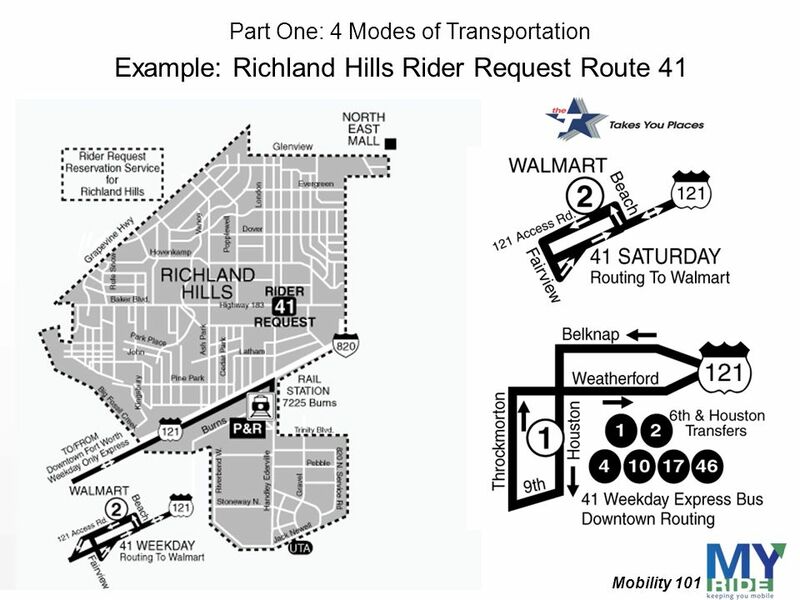 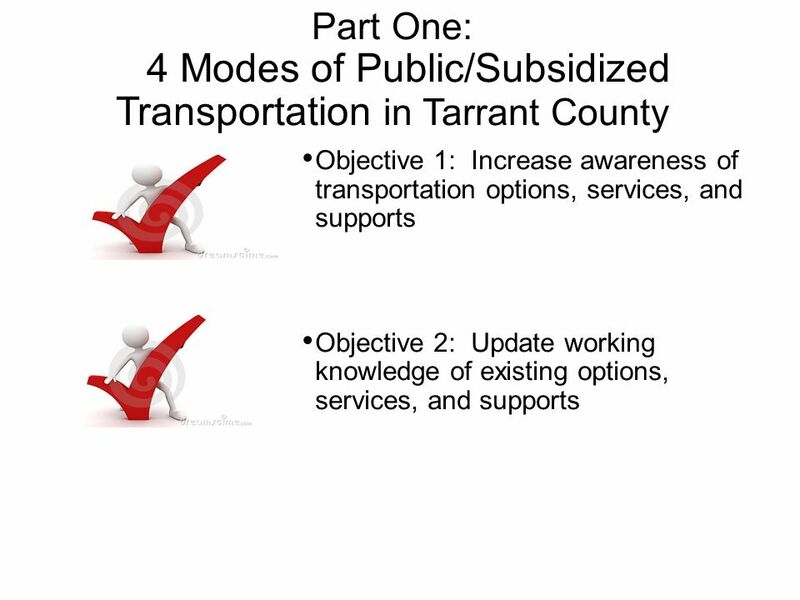 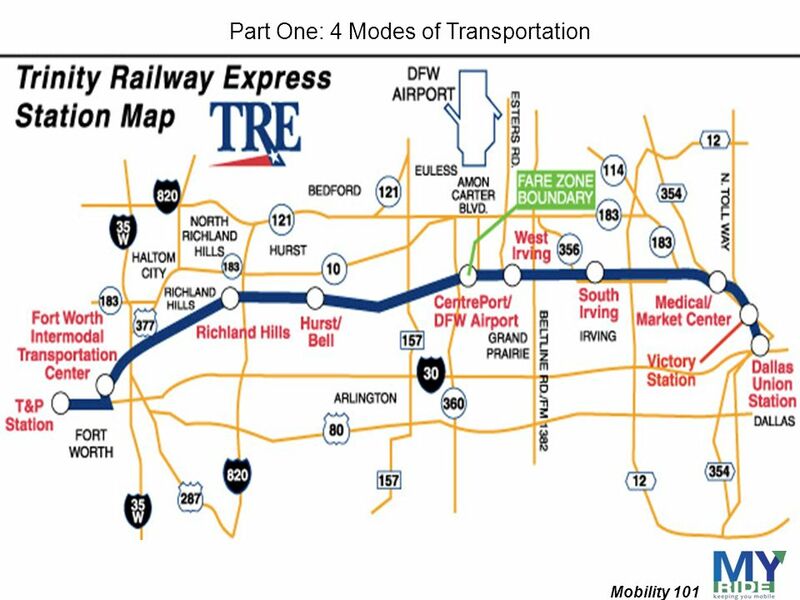 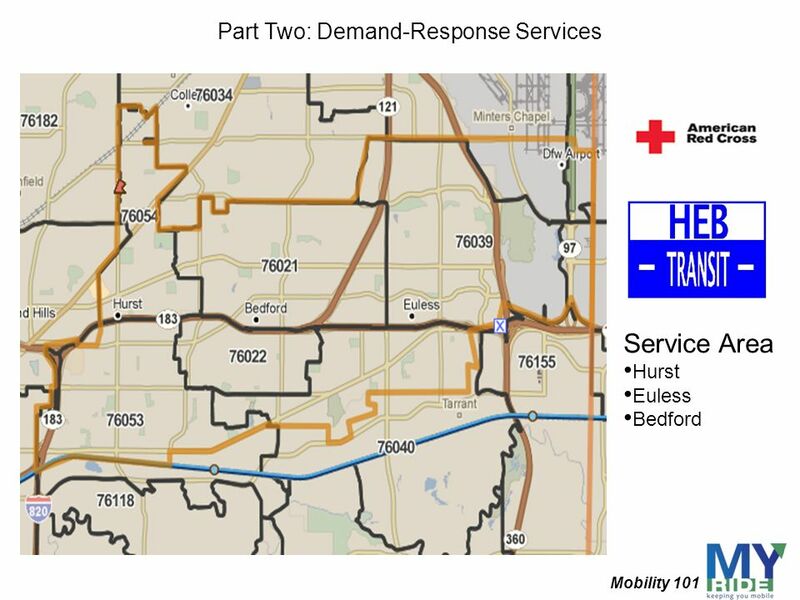 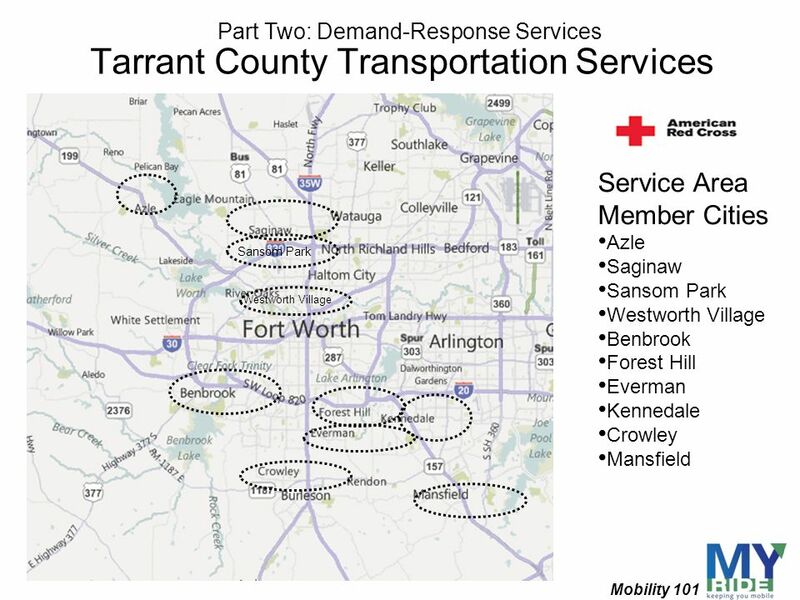 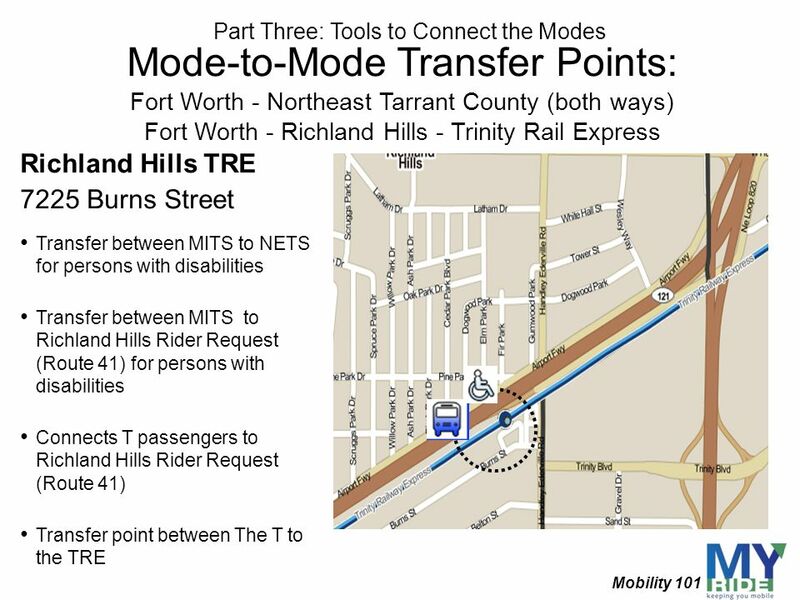 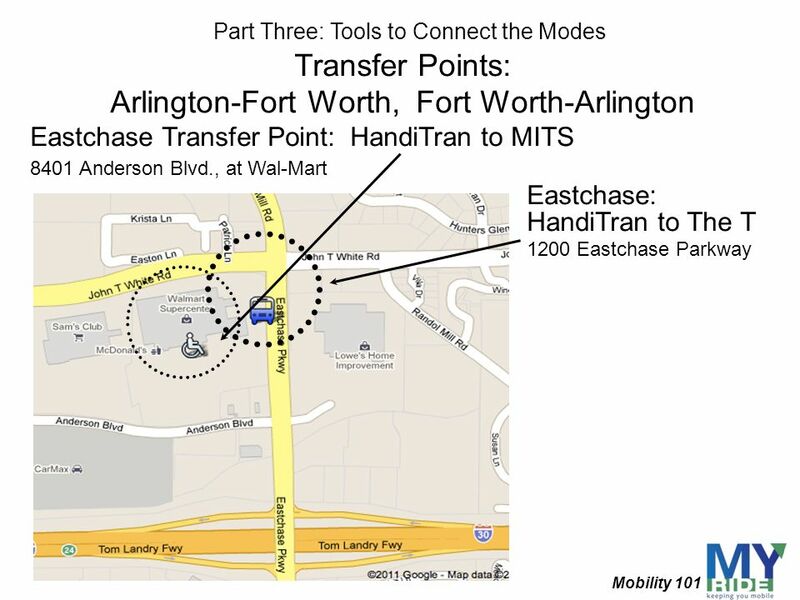 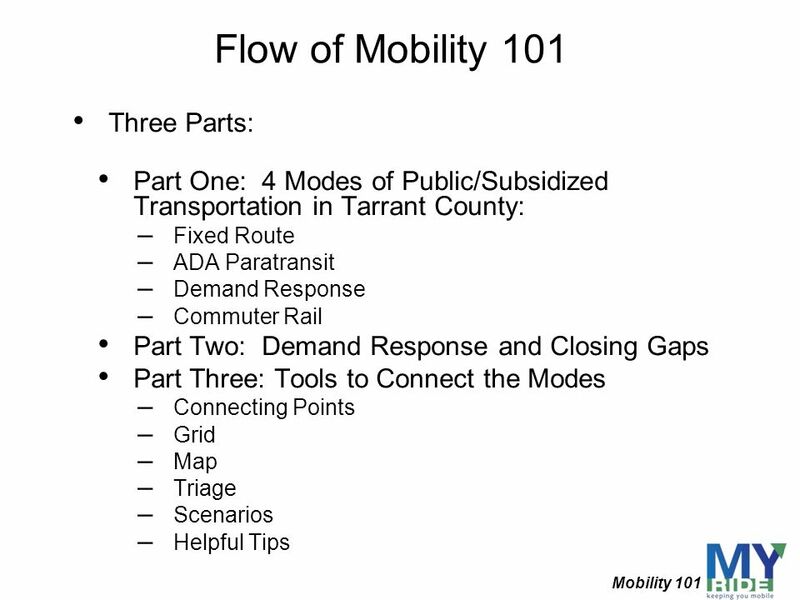 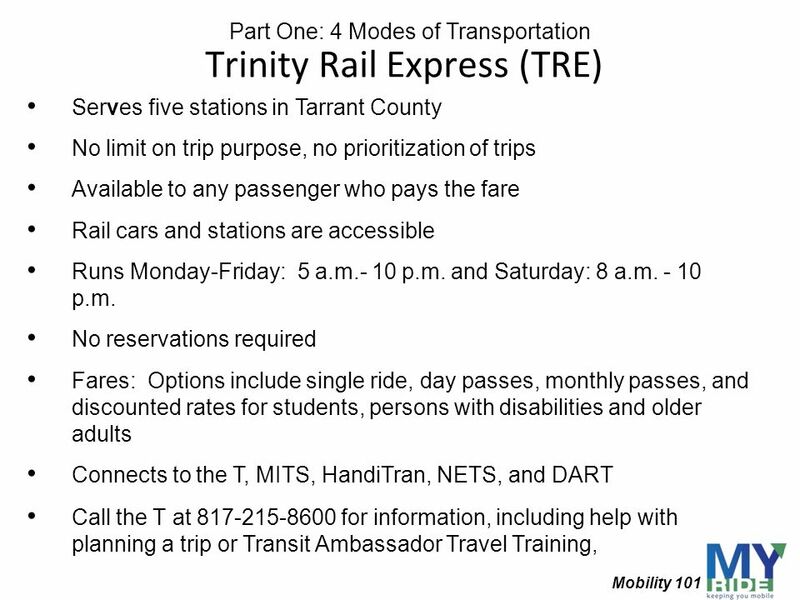 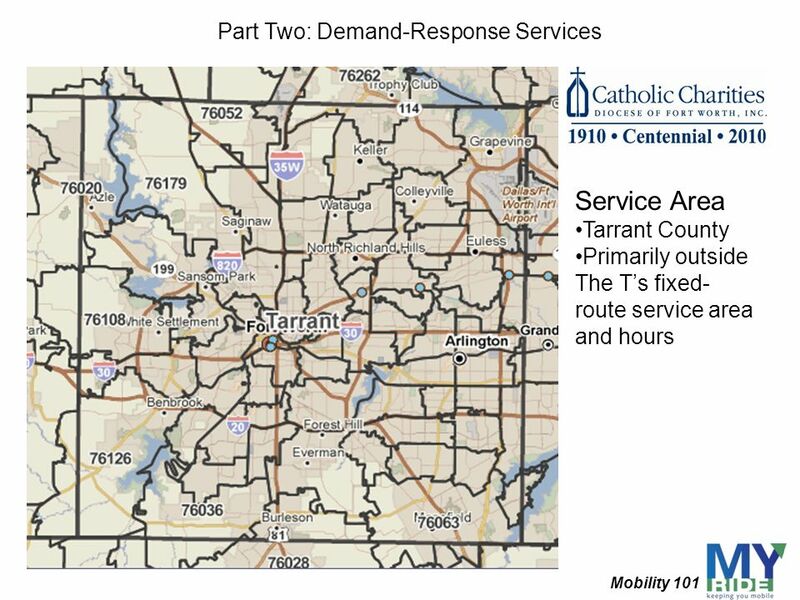 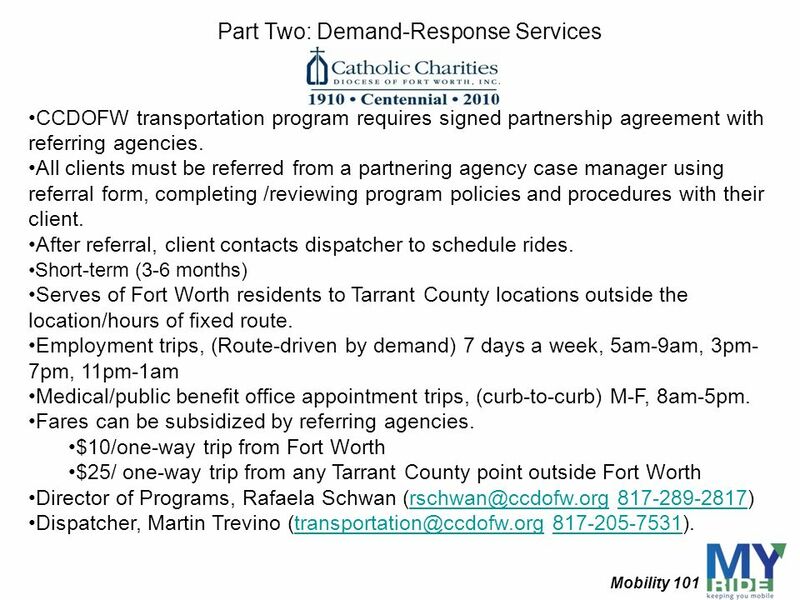 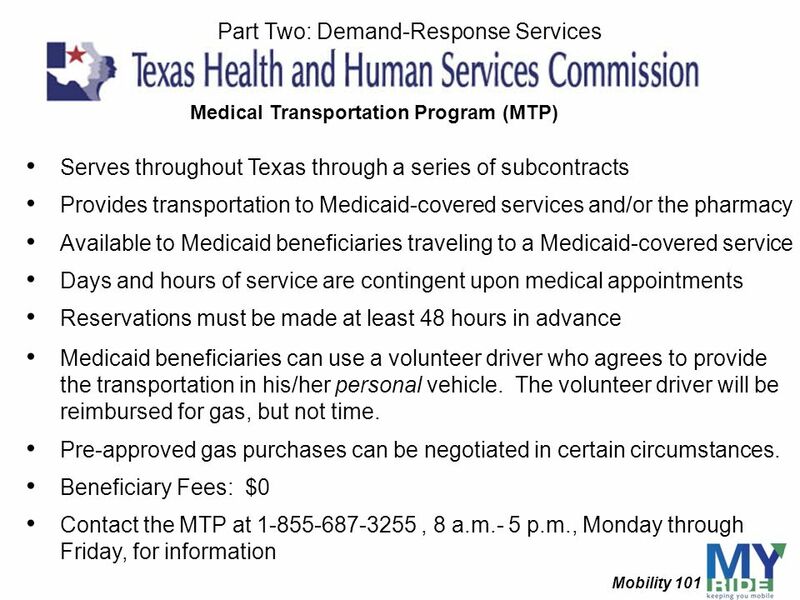 Part One: 4 Modes of Public/Subsidized Transportation in Tarrant County Objective 1: Increase awareness of transportation options, services, and supports Objective 2: Update working knowledge of existing options, services, and supports Focus of this first section is to review the various kinds of transportation options that exist. 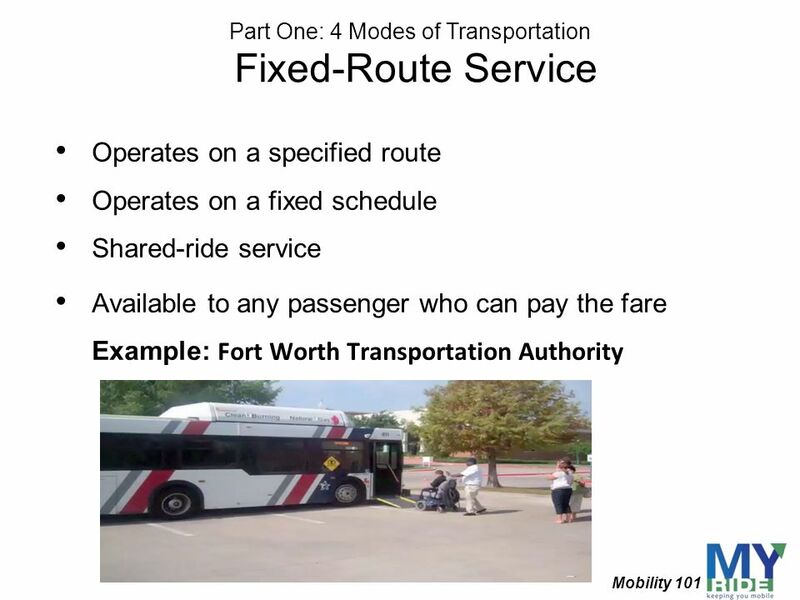 For some of you, the language may be new. 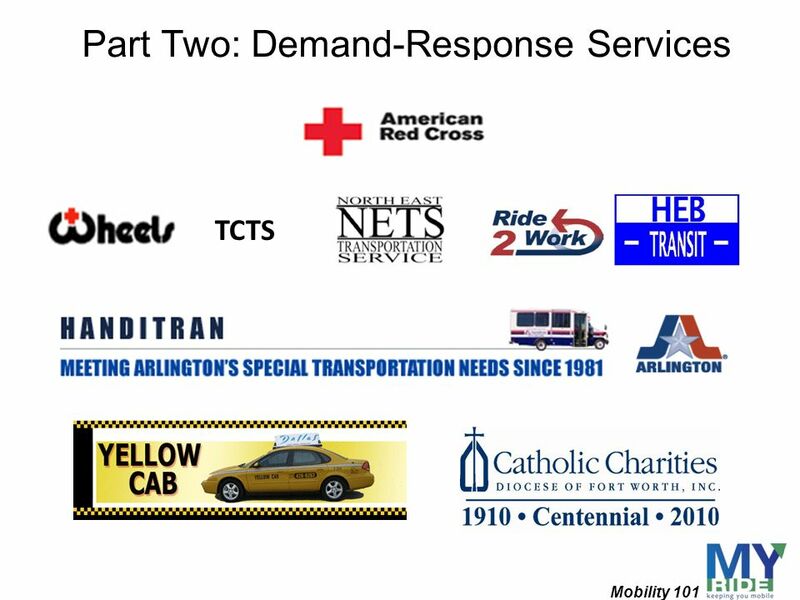 The purpose of introducing and using these terms is not to baffle you, but to be sure that you are acquainted with terms commonly used by many of the agencies that provide service. 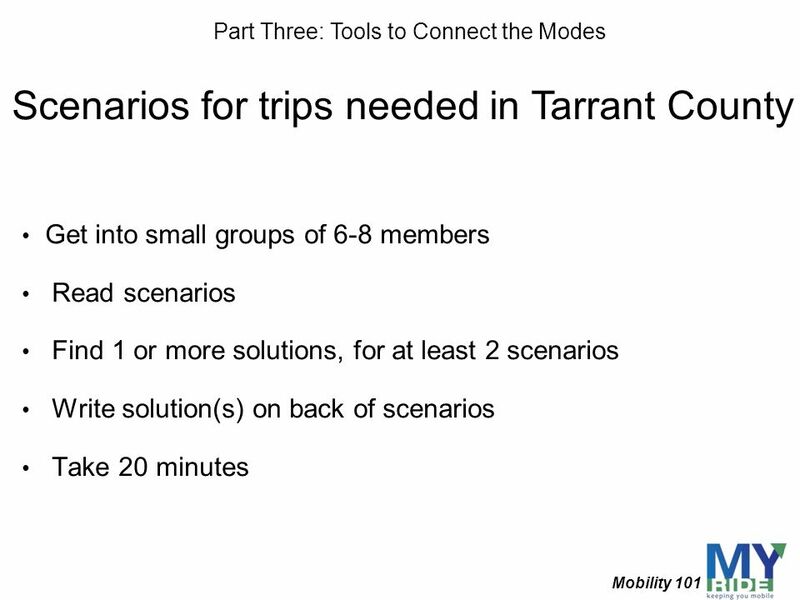 In other words, you will be familiar enough to follow along-- most of the time. 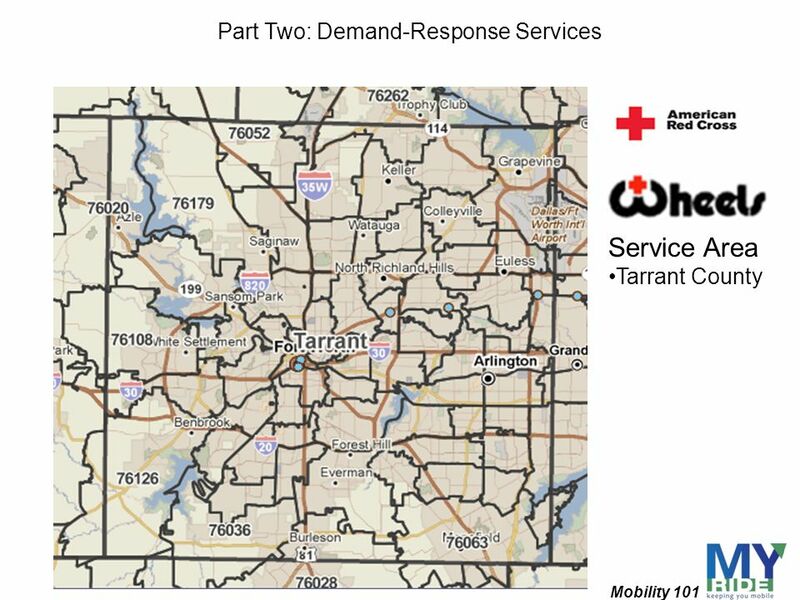 Where & When Where does the person live? 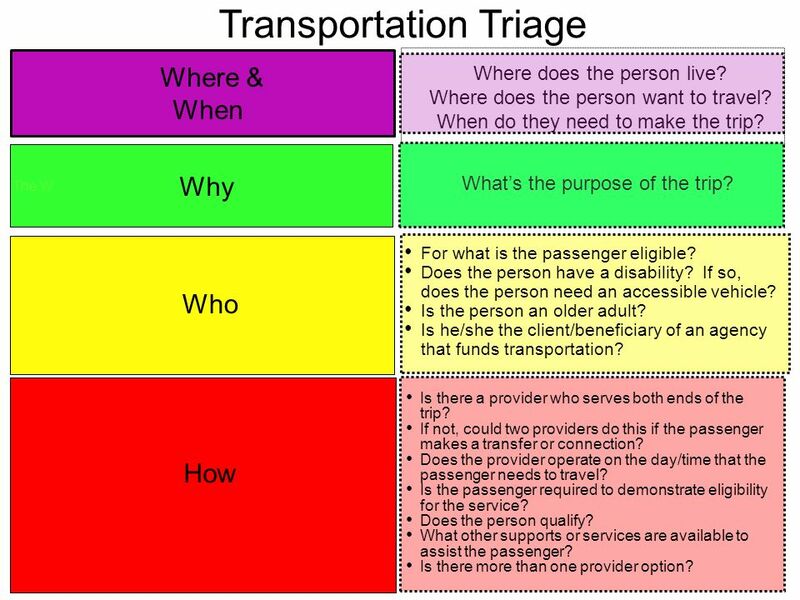 Where does the person want to travel? 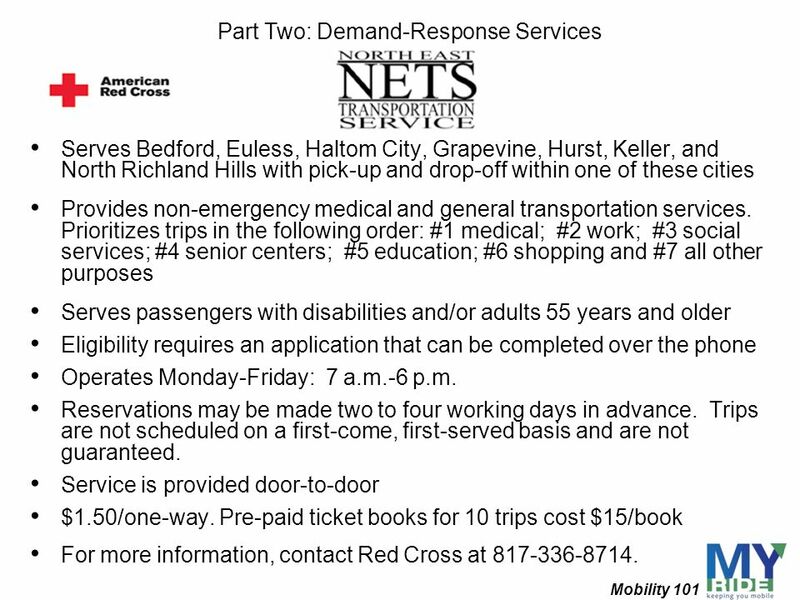 When do they need to make the trip? 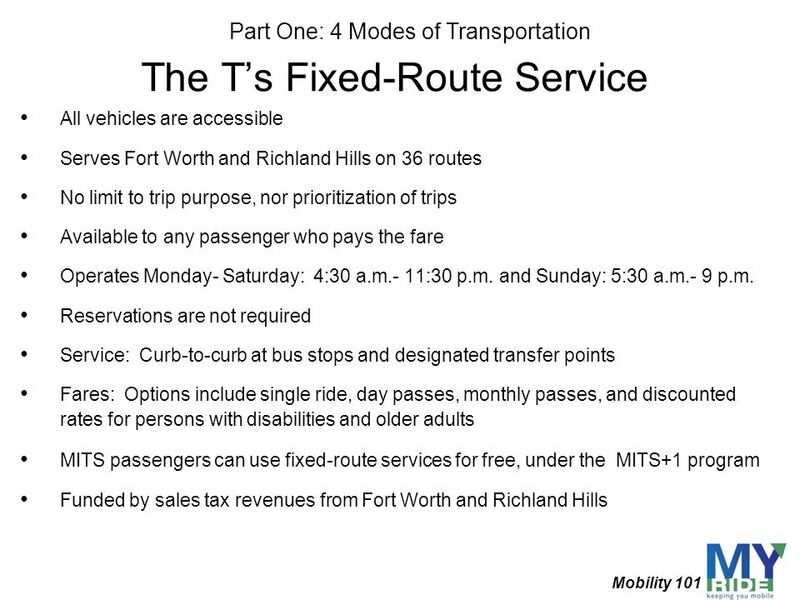 The W Why What’s the purpose of the trip? 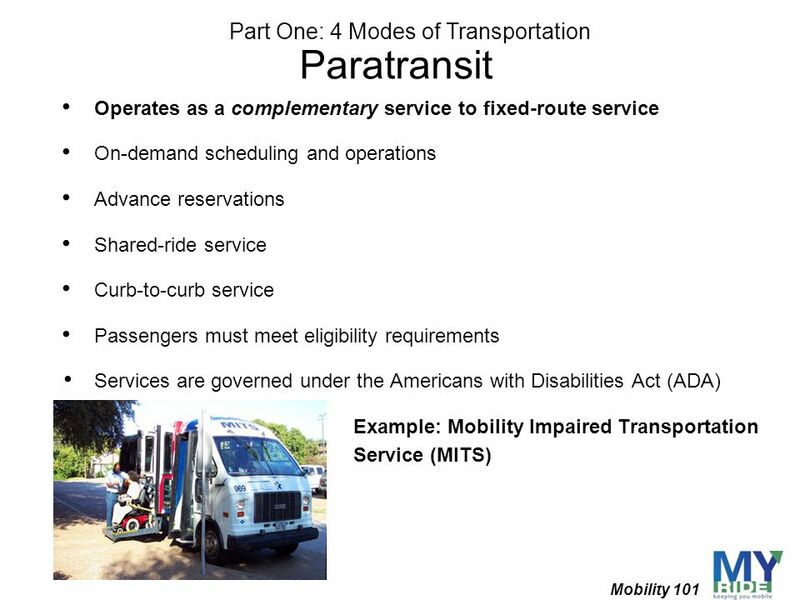 For what is the passenger eligible? 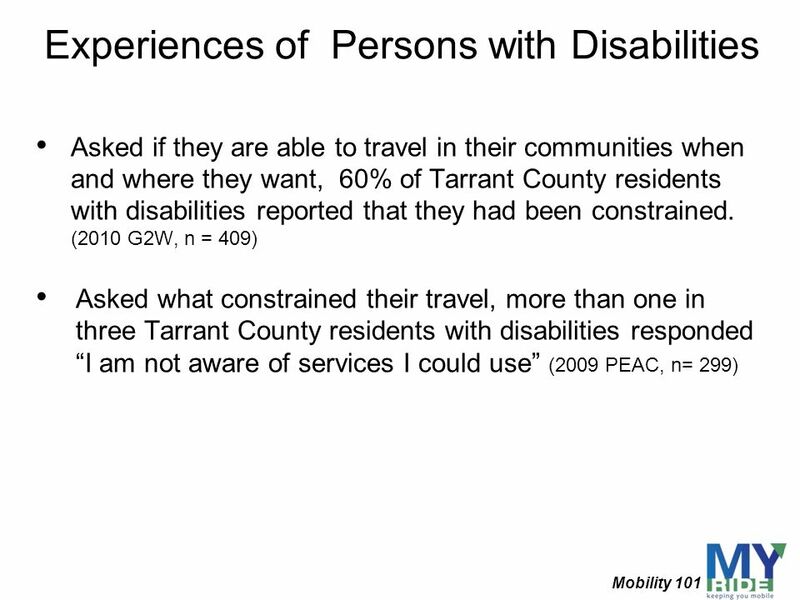 Does the person have a disability? 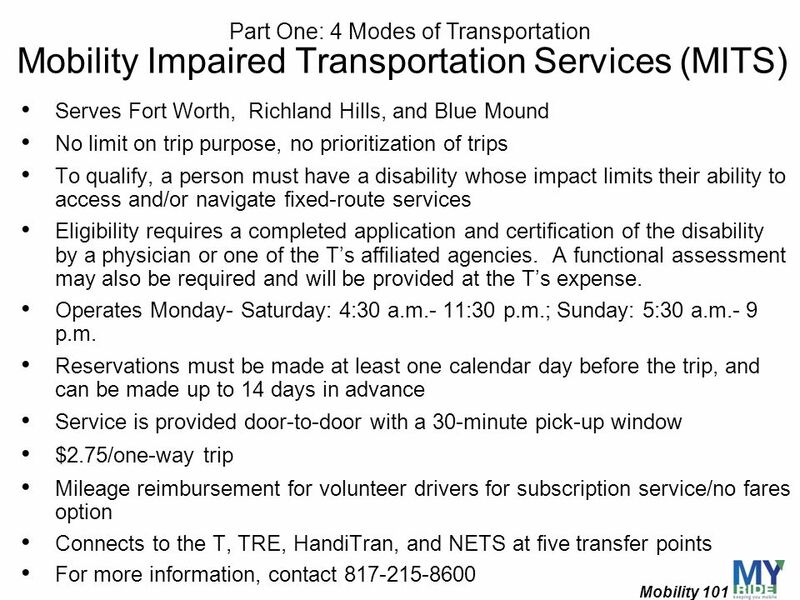 If so, does the person need an accessible vehicle? 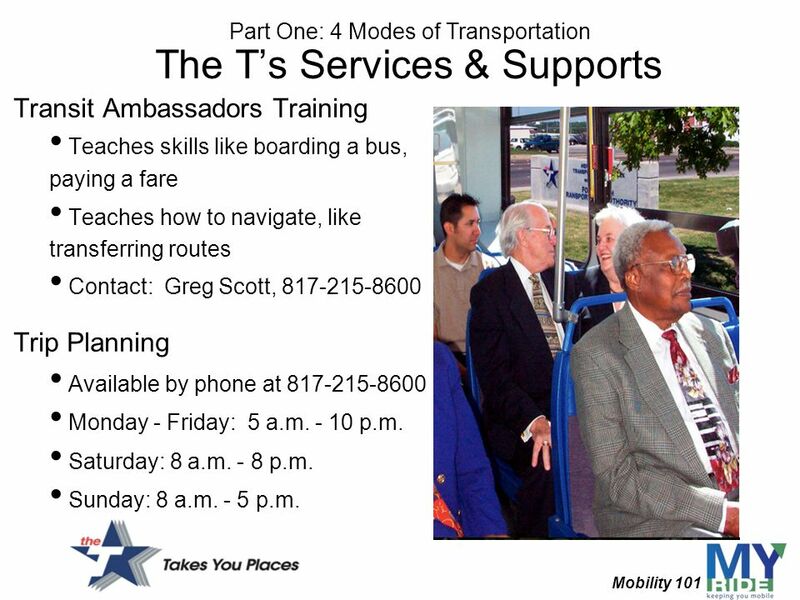 Is the person an older adult? 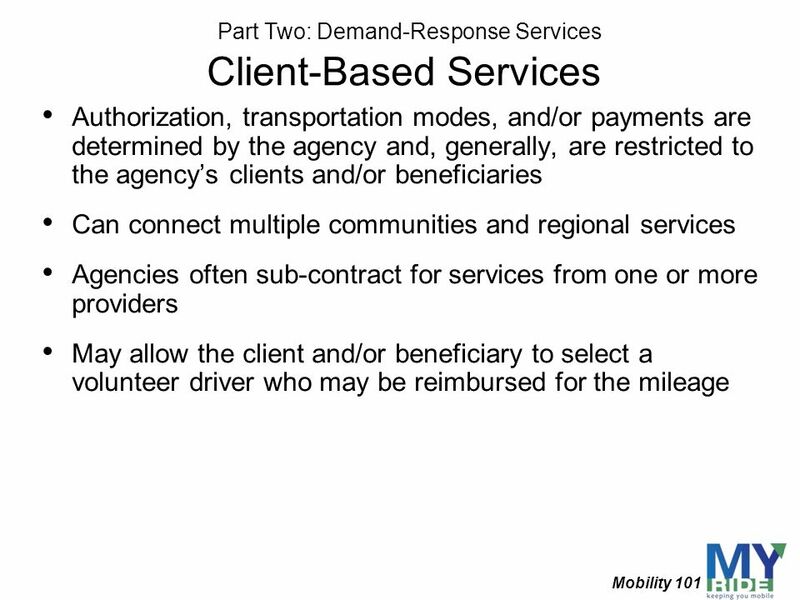 Is he/she the client/beneficiary of an agency that funds transportation? 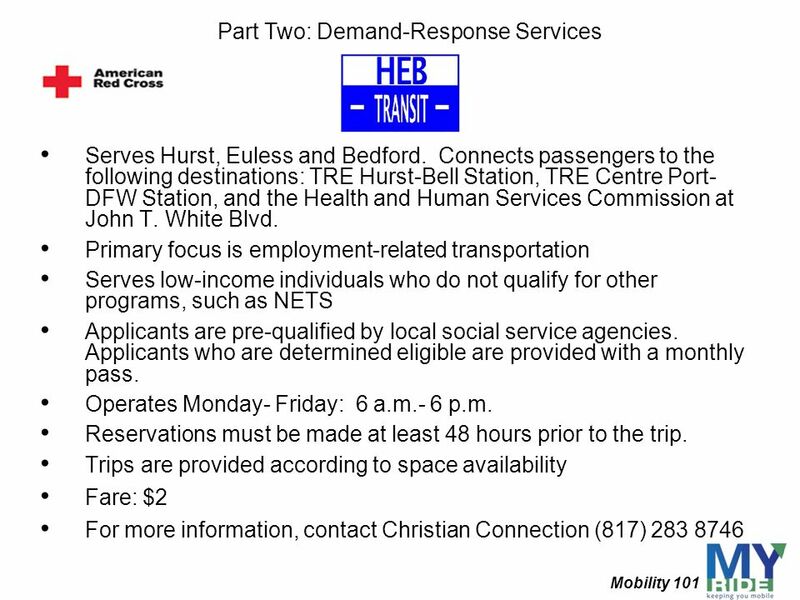 Who The Why Is there a provider who serves both ends of the trip? 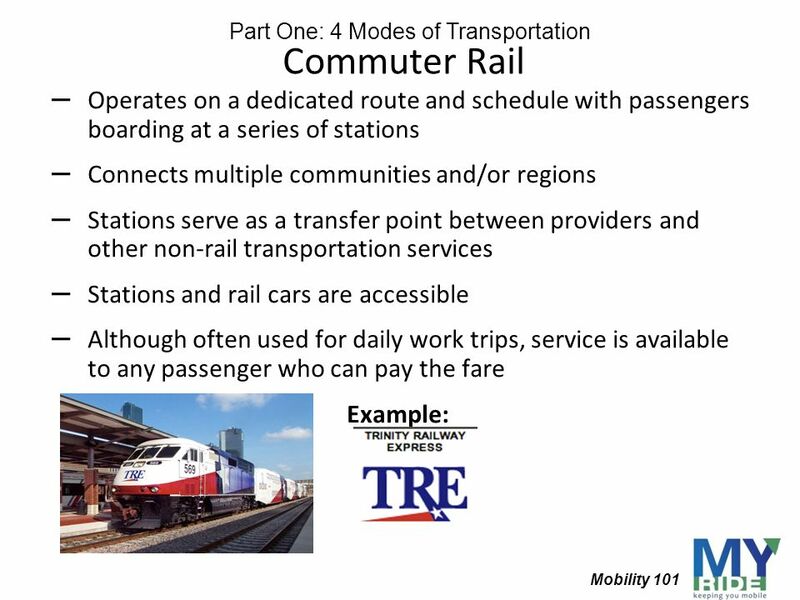 If not, could two providers do this if the passenger makes a transfer or connection? 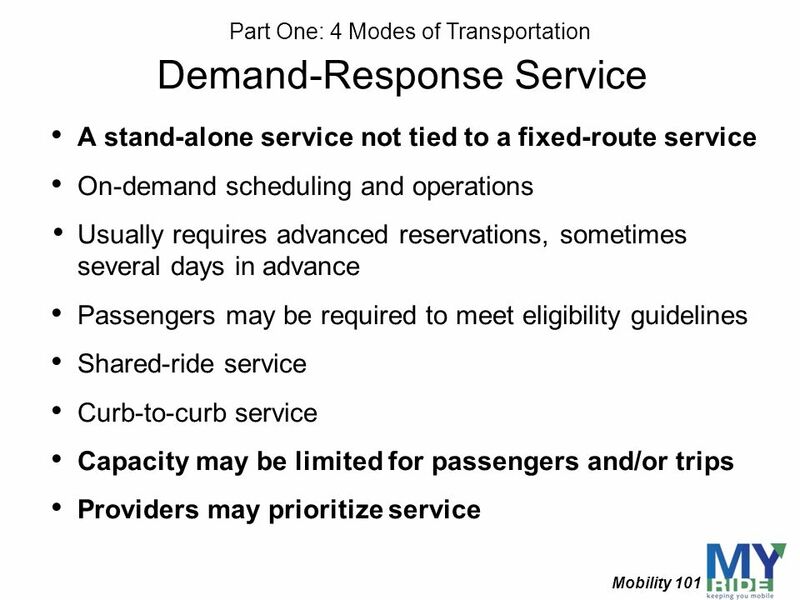 Does the provider operate on the day/time that the passenger needs to travel? 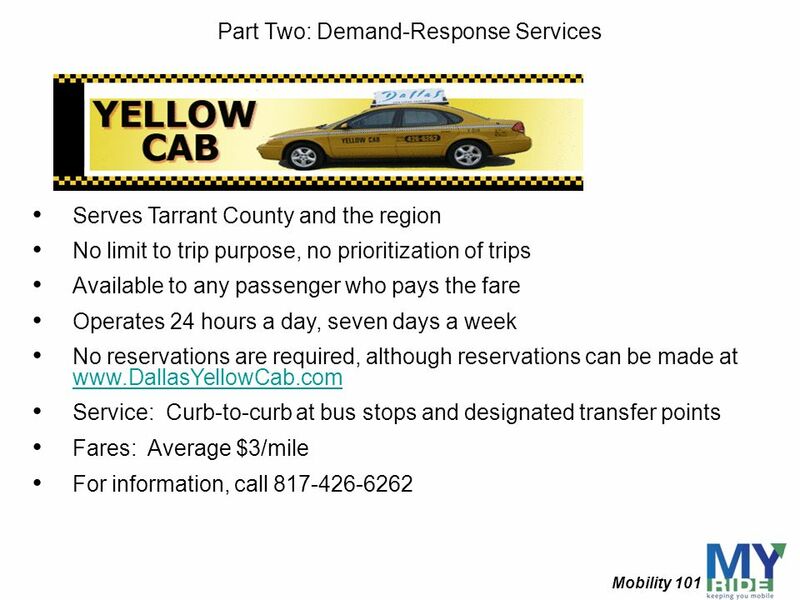 Is the passenger required to demonstrate eligibility for the service? 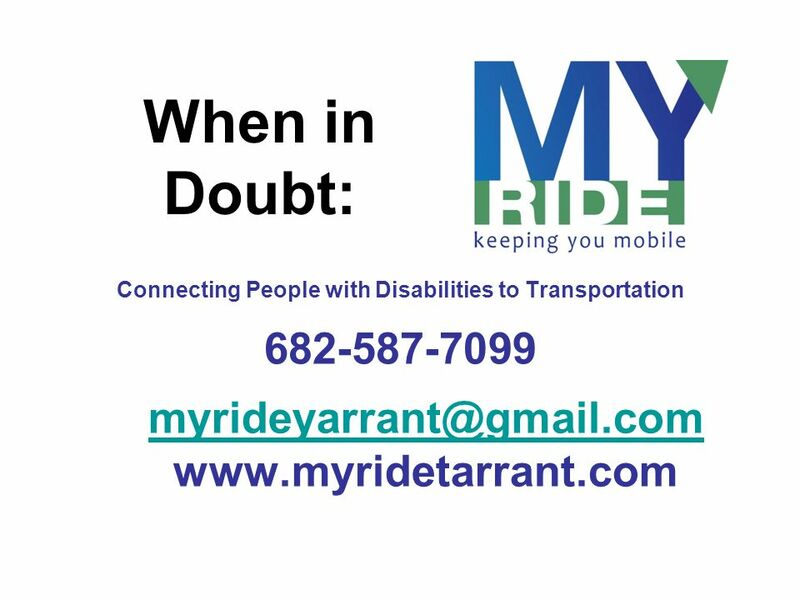 Does the person qualify? 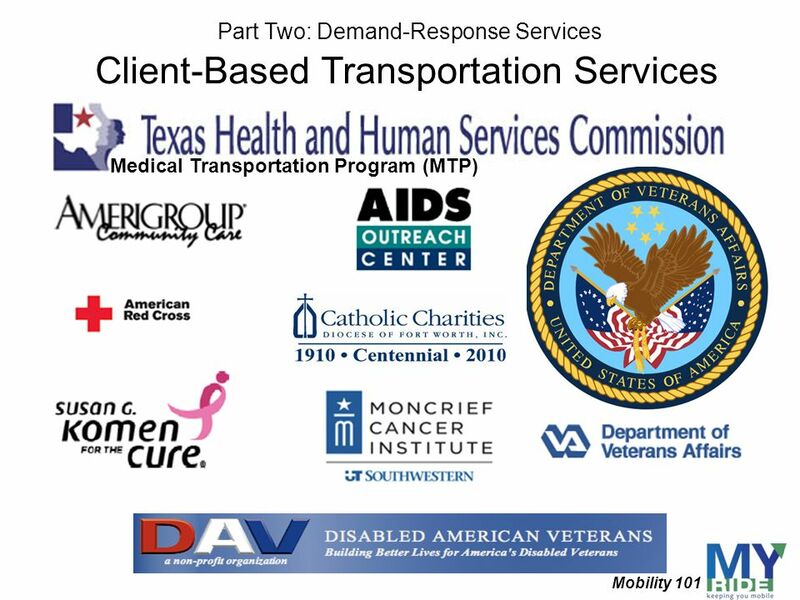 What other supports or services are available to assist the passenger? 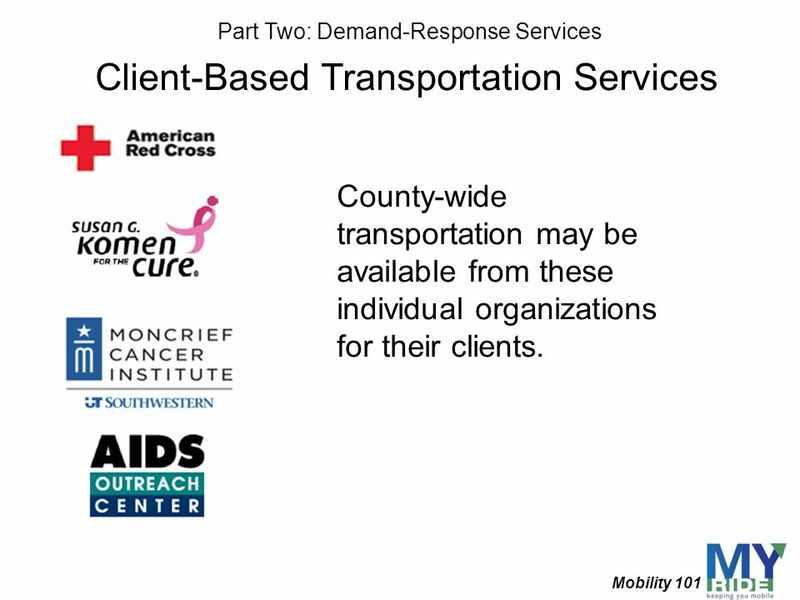 Is there more than one provider option? 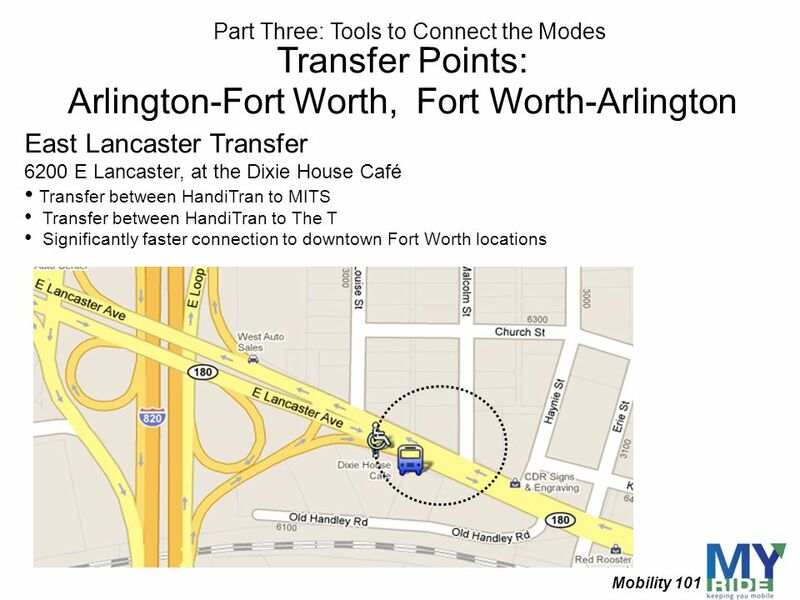 How To what destination are they traveling? 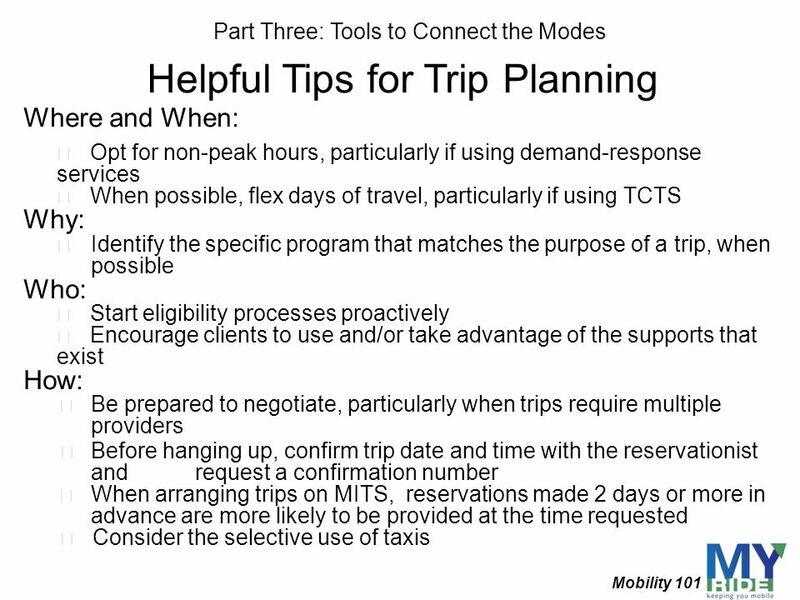 What’s the purpose of their trip? 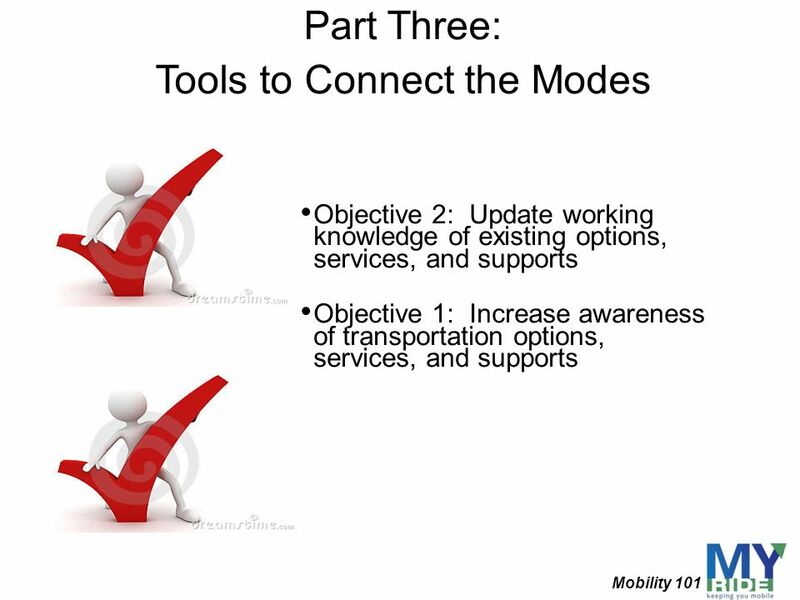 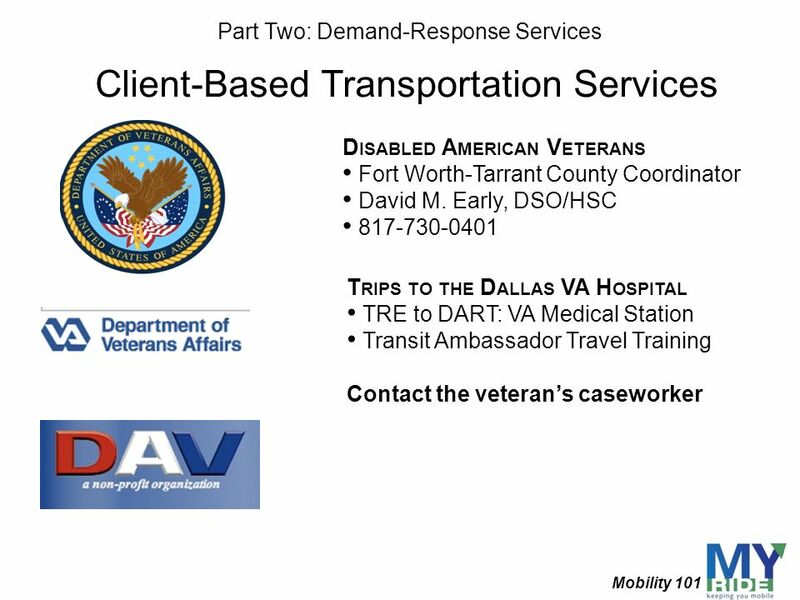 Download ppt "Mobility 101 Connecting People with Disabilities to Transportation"
22 nd Annual CTD Workshop WOW Session: “Few Staff, Many Trips” By Ross Silvers PSTA’s Mobility Manager. 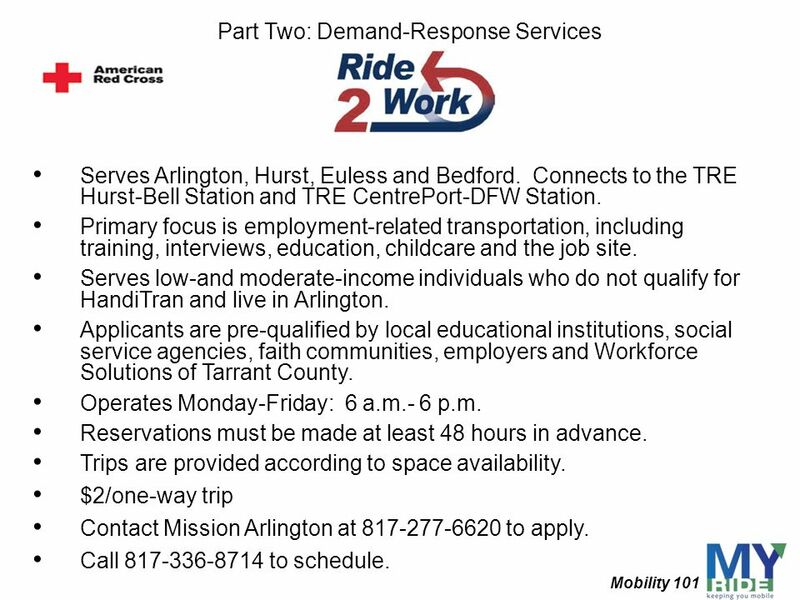 LYNX A Regional Transportation System Lisa Darnall Chief Operating Officer LYNX July 14, 2010. 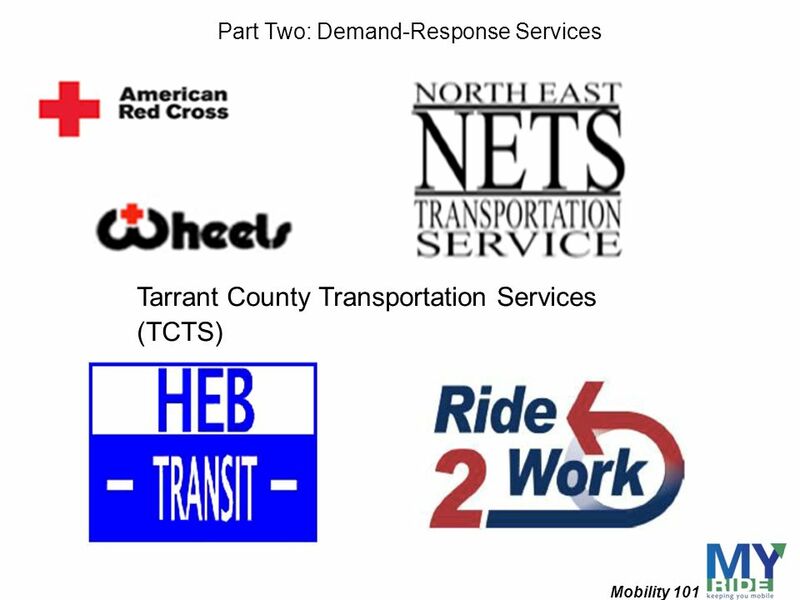 Texas Coordination Institute August,  Schedule / Dispatch  Maintenance  Driver Training  Vehicle Sharing. 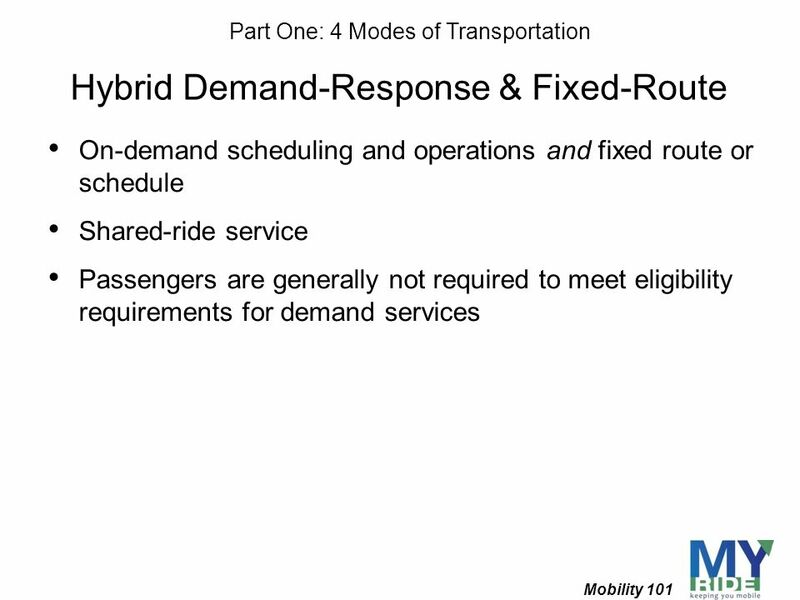 #EMF2014 Transportation Solution Roundtable. 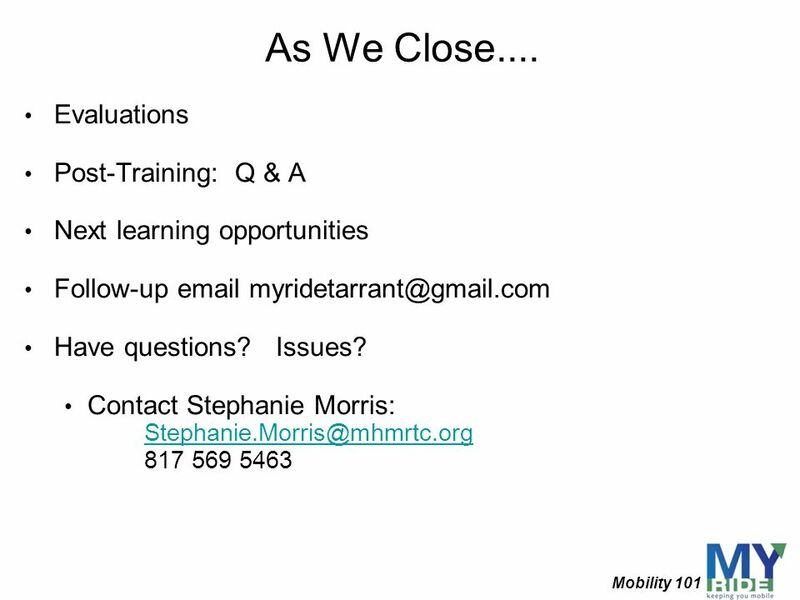 #EMF2014 Post-Presentation Discussion Period. 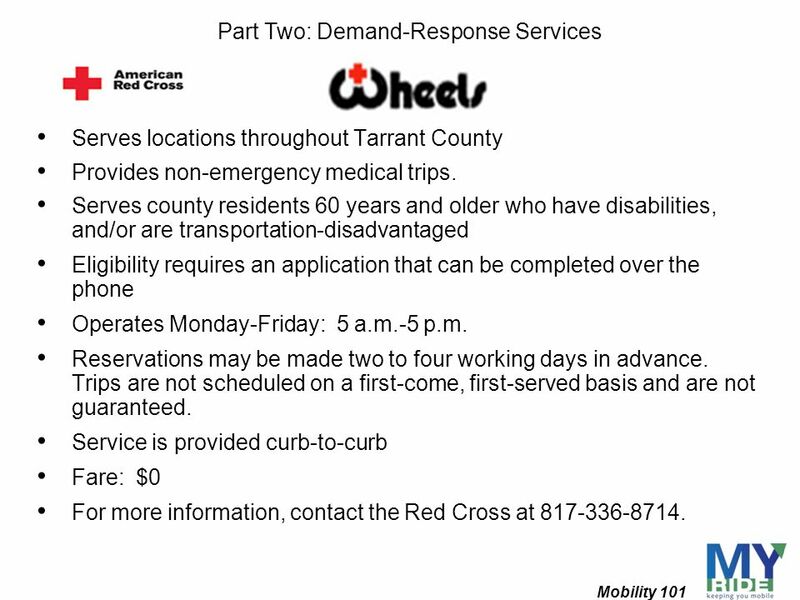 Indiana County Department Of Human Services Medical Assistance Transportation Program. 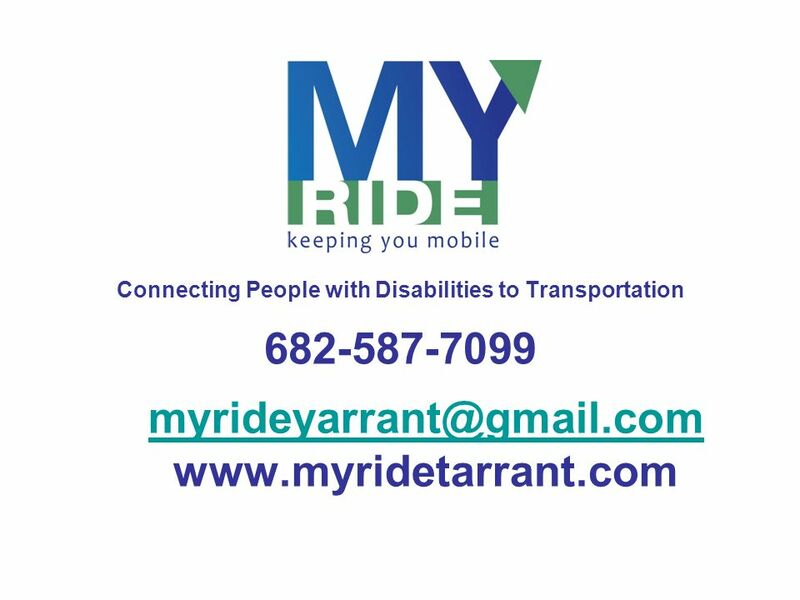 ANYBODY CAN RIDE! 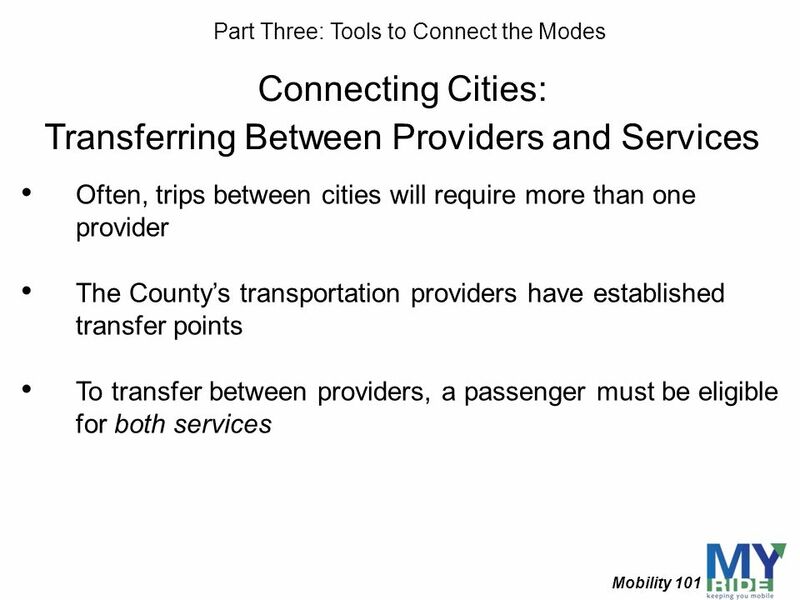 Examples of successful rural transit programs and practices elsewhere in the United States. 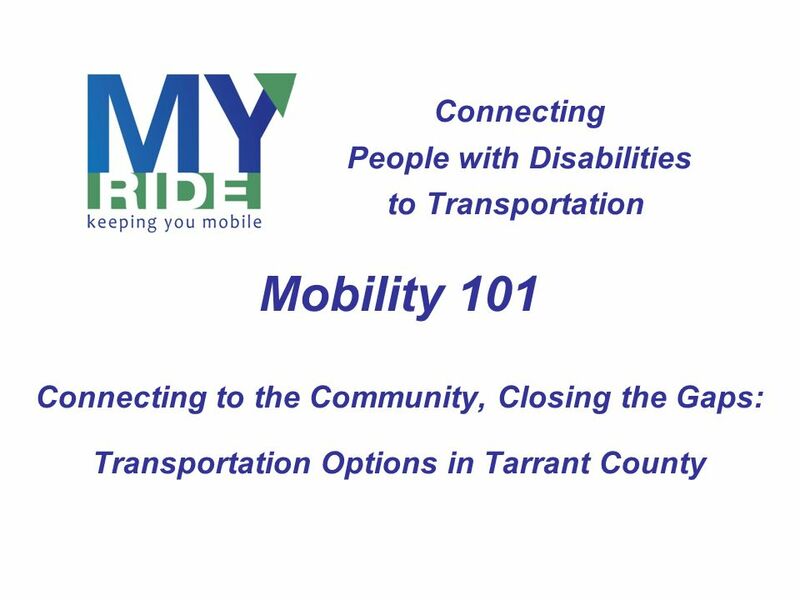 Mobility Management Increasing Independence for Community Members. 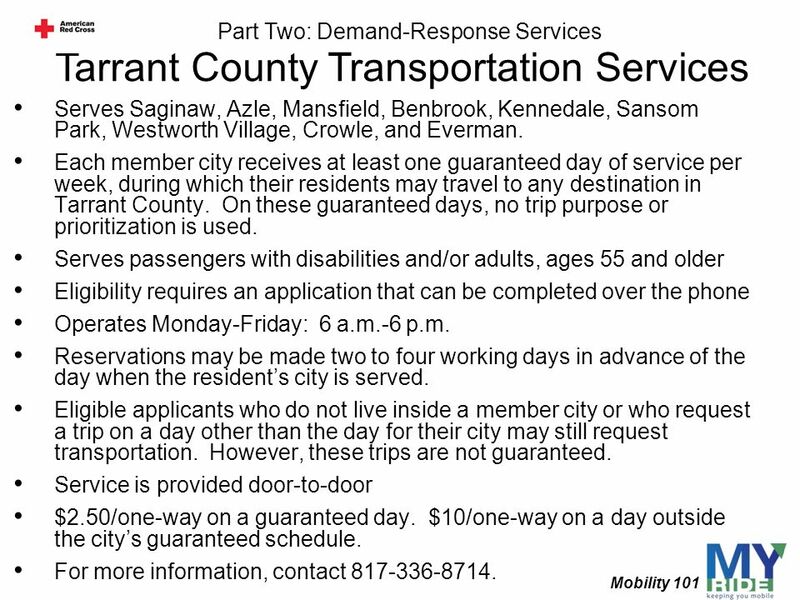 Westmoreland County Transit Authority Hop on! 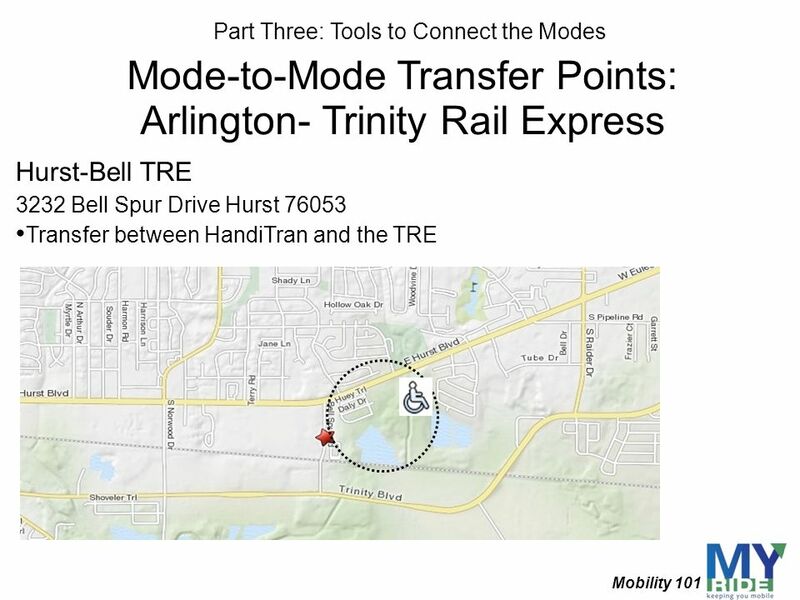 We’re headed your way! 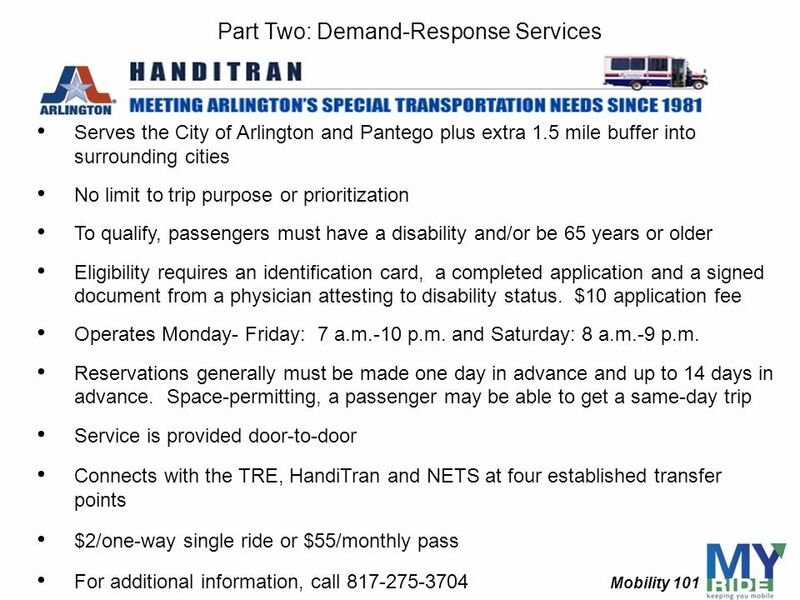 FAIRFAX AREA TRANSPORTATION OPTIONS FOR OLDER ADULTS AND PEOPLE WITH DISABILITIES: SURVEY RESULTS. 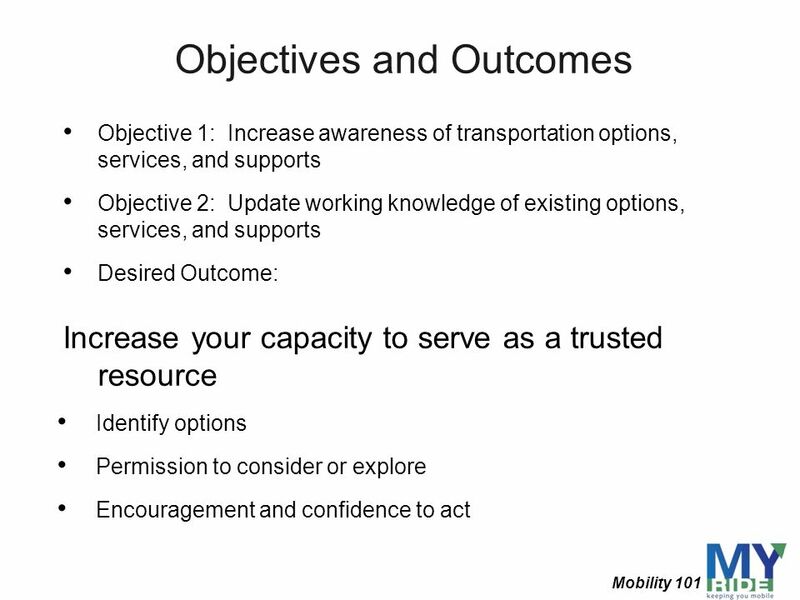 Calaveras Transit Intercity Service Feasibility Study Draft Alternatives Presented by: Gordon Shaw, PE, AICP and Genevieve Evans, AICP LSC Transportation.